The CDCN-5800 model has been discontinued. Please see the DPU91-Conductivity Series as a possible alternative or contact our Flow Engineering Department. The CDCN-5800 conductivity/resistivity indicator can accommodate a complete range of applications without factory configuration. 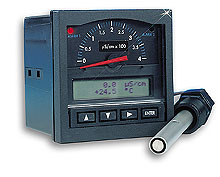 Software menu control of temperature compensation, plus options to display µS, mS, K½, M½ or PPM (TDS) provide a wide dynamic range of operation. Linearity is assured over a wide range without the need for troublesome platinized or graphite electrodes, thanks to state-of-the-art electronics. Order probe separately, see related link below.